This video has been so highly requested, I’m very happy to be blogging about it today. There are very few things I am 100% confident about in terms of my abilities – I am pretty good at a fair amount of things, but I can say with confidence that I am really good at doing my nails. I know this, because you guys are always telling me on Twitter and Instagram how professional my manicures look whenever I post a photo of my latest mani on Instagram. While we’re on that topic, thank you so much to everyone who takes the time to compliment me on my nails. You always bring a smile to my face! 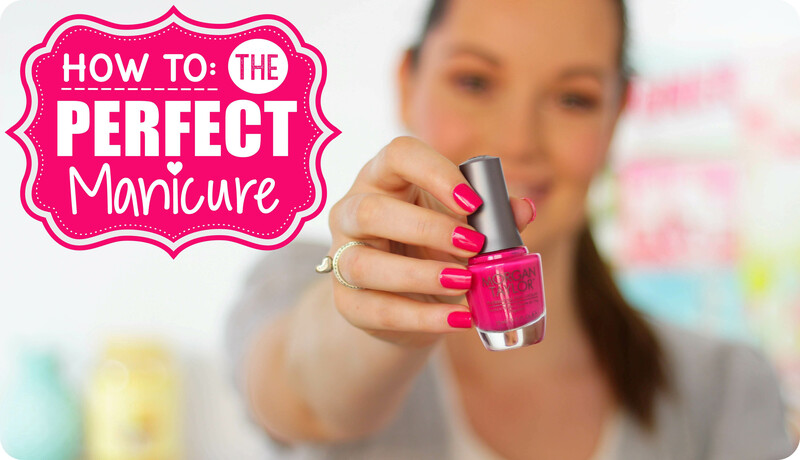 Today, I’m going to show you how you can get your manicure to look like you just stepped out of a nail bar / nail salon. Trust me, nail clean up is quick & easy – especially when you take the time while painting your nails to try stay inside the perimeter of the nail. But if you tend to flood the cuticle with nail polish, or you have a shaky hand, don’t worry – I got you covered! I’m not going to write too much about clean up or how I paint my nails in this blog post because I cover everything you need to know in the video. I feature my favourite base coats, top coat, nail clean up brushes and nail polish removers in the video as well, plus I explain why using some of the products are so important to use. I also give you a very important tip to help keep your nails chip-free for longer. So…if you would like to see how you can get your manicures to look neat, crisp and professional-looking (like the photo below), then watch my latest video. This video is best watched on YouTube (not within this blog post), as you really need to see what I’m doing close up. So click on the underlined section that says ‘How To: Nail Polish Clean Up For The Perfect Ma…’ and it will open up on YouTube. I hope you find this video to be helpful and if you decide start cleaning up your own manicures because of my video, tag me in a photo on Twitter or Instagram – I’d love to see it! Remember to subscribe to my YouTube channel if you would like to watch my videos as soon as they are loaded. Your nails are perfect even without colour! Please do a full one with guidelines on how you shape your nails. Love your blog, its the only one I read religiously! Superb video, Luzanne! I tend to always do a very messy job of my manicures but will defs be using your tips and tricks this weekend when I paint my nails. Obessed with your youtube channel and blog lately! Yay!! Thank you so much, Taz! Looking forward to many more videos from you! You really are a pro!!! Am going to watch this as soon as I get home because I really need some tips. I am one of those awful people that paint onto the skin and then peel it off with hand cream since I am too lazy to try and get it all covered without touching the sides eek! Looking forward to your next vid!